Ottoville’s Taylor Beining, left, and Quinley Schlagbaum block the spike from Columbus Grove’s Rylee Sybert on Monday evening at Ottoville. Columbus Grove won 3-1 with scores of 25-16, Ottoville 25-27, 25-23 and Grove 26-24. COLUMBUS — St. Marys maintained its top spot in Division IV in the Associated Press Ohio High School Prep poll released Monday. The Roughriders escaped with a one-point victory over Shawnee 28-27 Friday and will take on Kenton this Friday night. Coincidentally, Kenton, who beat previously fifth ranked Wapakoneta, 15-10, made its first appearance in the poll after coming in at No. 12. Lima Central Catholic went up two spots to No. 6 in the Division VI poll. Coldwater and Marion Local are ranked No. 1 and No. 2 in the Division VI. Crestview also moved up two spots in Division VII poll and Leipsic climbed one slot to No. 8. Pandora-Gilboa finds itself at No. 11. Minster dropped from the top spot to No.5. ARLINGTON — Leipsic defeated Arlington in straight sets 25-12, 25-15 and 25-21. For the Vikings Hayley Heitmeyer ahd 12 kills and seven blocks. Carlee Siefker added nine kills and 10 digs and Kacey Dulle had 10 digs. Lyndie Hazelton recorded 14 assists and Selena Loredo had 11 assists. Brooke Brown was 14-14 serving and Liz Schecklhoff had four kills and seven blocks. OTTOVILLE — Columbus Grove won in four sets, 25-16, 25-27, 25-23 and 26-24. For Ottoville Quinley Schlagbaum had 12 kills, 25 digs and two aces. Brynlee Hanneman had 15 kills, 13 digs and six blocks and Kylee Hoersten had 34 assists and 10 digs and Madison Averesch had 12 digs. 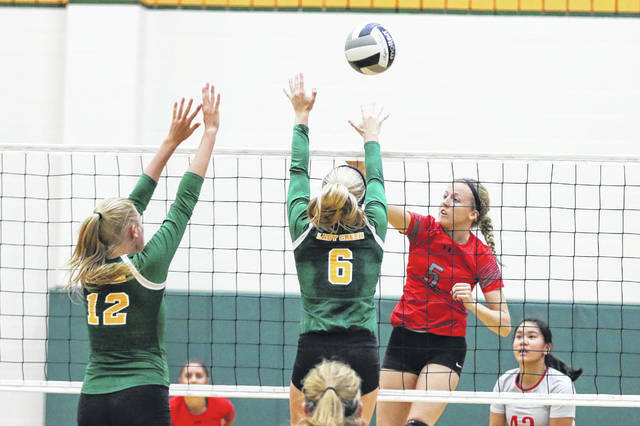 PERRY TOWNSHIP — Continental’s Jessica Stauffer had 29 assists, four kills and 15 digs and Breanne Eickholt had six kills, three blocks, two aces and eight digs. Brook Bradford had 11 kills and 11 digs and two aces. Madelyn Potts had eight kills, 14 digs and three aces. Kennedy Hiltner had 17 digs and one ace and Mackenzie Rayle had six kills, 10 digs and two aces. PAULDING — Delphos Jefferson’s Maddie McConnahea scored six goals and one assist. Other Wildcats scoring goals were Lizzie Chung, Kenzi Coffey and Hannah Dickson. Emily Dienstberger recorded an assist. OTTAWA — Ottawa’s Ethan White, Nolan Unterbrink and Derek Crumrine all scored goals. Celina got goals from Jim Aquino and Josh Kuehne. Recording assists were Unterbrink, White and Ethan Alt. Titan Goalie Ethan Alt had nine saves. Elida’s Seth Mahlmeister had two goals and Tyler Long and Logan Johnson each recorded assists. Kenton got singles wins from Makaela Schriber, Kelsey Flowers and Lily Osborn and doubles wins from the duo of Elizabeth Heintz and Abigal Hartshorn and the pair of Abilgal Oberutner and Kayce Sherman. Shawnee got singles wins from Arai Patel and Alotus Wei and doubles victories from the team of Sanjana Rajasekarum and Katie Clark and Ella Atkinson Lade Onqmusi. Bath’s Ruby Bolon collected the lone Wildcat win in singles play. VAN WERT — Van Wert got singles wins from Allie Etter and Emma Rutkowski and doubles wins from Olivia Kline and Paige Moonshower and Jada Buckner and Lizzie Rutkowski. Celina’s lone win came from Sierra Zuercher in singles action. Spencerville’s Ethan Harmon was the medalist with a 36. Other Bearcat scores were Gavin Harmon 37, Alex Gallman 46 and Drake Mertz 46. For Columbus Grove Zac Roberts shot a 43. Other Bulldog scores were Jacob Oglesbee 48, Austin Macke 51 and Owen Macke 54. For Allen East, Zach Miller posted a 47. Other Mustang scores were Cartery Fry 50, Nick Phillips 50 and Brady Harris 50. For Delphos, Braxton Scalf shot a 43. Other Jefferson scores were Logan Gallmeier, Brady Johnson 54 and Darius Shurelds 58. ST. MARYS — Rider Clay Quellhorst was the medalist after scoring a 35. Other St. Marys scores were Reese Sweigart 36, Calvin Caywood 40 and Austin Boley. For St. Henry Rylee Deitsch shot a 36. Other Redskin scores were Andrew Mescher 38, Jack Romer 39 and Lucas Grieshop 40. St. Marys remains unbeaten at 10-0. St. Henry improves to 10-2. OTTAWA — Kalida’s Christian Nartker was the medalist after shooting a 38. Other Kalida scores were Alec Edelbrock 39, Josh Recker 42 and David Peck 46. For Shawnee John Barker fired a 39. Other Indian scores were Jake Hutchins 41 and Justin Altenbach 43 .Kalida improves to 9-0 and Shawnee falls to 7-3. WAPAKONETA — Wapakoneta’s Drew Zwiebel was the medalist with a 40. Other Redskin scores were Clay Wilsey 62, Dylan Timmerman 49, Jon Hefner 43, Tim Bruns 48 and Gabe Bogan 49. The low for Defiance was Will Lammers 45. Wapakoneta improves to 9-3 and 7-2 in the Western Buckeye League, Defiance falls to 6-5 and 5-4 in the league. https://www.limaohio.com/wp-content/uploads/sites/54/2018/09/web1_Columbus-Grove-vs-Ottoville-Volleyball-6721.jpgOttoville’s Taylor Beining, left, and Quinley Schlagbaum block the spike from Columbus Grove’s Rylee Sybert on Monday evening at Ottoville. Columbus Grove won 3-1 with scores of 25-16, Ottoville 25-27, 25-23 and Grove 26-24.